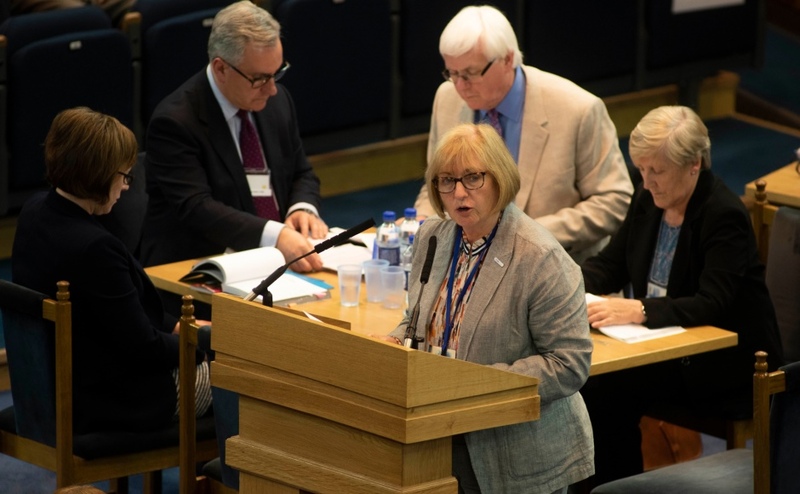 Sally Bonnar, convener of the Council of Assembly introduced the strategic plan, Worshipping God, Inspiring Faith, Connecting People, saying it was the result of two years of work and a widespread grassroots consultation that had involved more than 2,000 church members across Scotland. “Words which emerged here from people include change, fluidity, uncertainty, constant shifts. An impression of a constantly and rapidly changing landscape. The plan, aimed to chart a course for the church for the next 10 years and to address the most pressing challenges facing the church including: reduced numbers in church congregations, missing generations of churchgoers, a dramatic fall in income, and the need to let go of surplus buildings. The Convener, in response, said she had much sympathy with what had been said and agreed that the Church needs radical change. However, she believed rapid change is hard to achieve because of the complexity of Church views and structures. Commissioners voted 439 to 130 in favour of Mr Allan’s amendment, meaning the Council of Assembly will now work to propose more radical reforms to be achieved in a shorter time. Mr Allan’s other proposals, which include a suggestion that reforms be based on the 2017 Chalmers lectures by theologian Rev Dr Doug Gay, and proposals from five other commissioners were discussed on Wednesday. "Instruct the Council to work collaboratively with other Councils, Committees and Presbyteries to bring proposals to the General Assembly of 2019 for structural change, consulting with the Rev Dr Doug Gay about the ideas contained in the recent Chalmers lectures and with other appropriate persons with expertise in the reform of institutions and structures, to enable a Church structure that is lean and fit for purpose to lead reform." Commissioners also considered the future of the national offices at 121 George Street, voicing concerns about the cost of the consultation, the delay in making a decision, and the expense of an Edinburgh based headquarters. However they agreed to instruct the Council of Assembly to continue its work and return with a recommendation in 2019.